Many power users would like to have more than one operating system available on a single computer, but a lack of storage usually has prevented them. Now that 30M and 40M hard drives are so inexpensive, things have changed. No need to give up Microsoft Windows to try out Linux or BeOS. The downside is that conflicts often occur between the OSes. V Communications' System Commander 2000 does a good job of handling the incompatibilities. 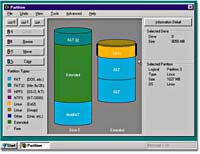 A graphical partitioning tool helps in allocating hard-drive space properly for dual OSes. It has not only a full-featured boot manager but also partitioning software to prepare a hard drive for each new operating system. Included is a CD-ROM with TurboLinux WorkStation 6.0 from TurboLinux Inc. of San Francisco plus Sun Microsystems Inc.'s StarOffice 5.1 suite for Windows, OS/2, Linux and SunSoft Solaris. System Commander 2000 has low resource requirements. It runs on any 386, 486 or Pentium PC with 3M of free storage. Windows 9x or MS-DOS must be on the system to install System Commander, but neither is required for using it. System Commander 2000 sets up a friendly OS neighborhood for all versions of Windows, Linux, many Unix flavors, OS/2, Novell NetWare and other operating systems. It's easy to install: Just insert the CD. If it doesn't start automatically, run setup.exe from the CD. After a reboot, System Commander will find and display all the installed operating systems. The printed user guide is excellent, covering both program operation and specific problems you may encounter when installing various OSes. I tested System Commander 2000 with two computers. I installed TurboLinux alongside Windows 98 on the first PC, a 450-MHz NEC Computer Systems Division Pentium II with 64M of RAM. On the second, an 800-MHz Dell Computer Corp. Pentium III with 128M of RAM, I installed Windows 2000 alongside Win98. After installation, System Commander brings up a menu of available OS choices at bootup. System Commander 2000 did an excellent job of guiding me through the installations. The NEC had 4G of unused storage, so I used System Commander's partitioning program to set aside the space for Linux. Next I started System Commander's OS Wizard, which prepared the space by moving an existing MS-DOS partition and then formatting the new Linux ext2 partitions. When it was done, the OS Wizard instructed me to insert the Linux disk and reboot. TurboLinux came on a bootable CD-ROM, which made the installation almost painless compared with my past Linux efforts. My only difficulty was in setting the video resolution properties correctly, but that was because I didn't read the instructions carefully the first time. It took less than 90 minutes to change the NEC from a machine that ran only Windows to a dual-boot system for Win98 and Linux. The second system, like the first, had Win98 on it when System Commander was installed. I started the OS Wizard and made the proper choices to install Win 2000. A short time later, the Dell was ready to run either Win98 or Win 2000, depending on which I chose at bootup. Both systems subsequently booted up to System Commander's OS Selection Menu instead of to an operating system. The NEC even gave me four choices: Win98 Second Edition, Win98 prompt, boot from drive a:\ or Linux. You can configure System Commander 2000 to wait until you make a menu selection or to boot automatically after a time. Or you can set it to default automatically to any of the available OSes or boot to the one last used. So far, so good. It's nice to have a PC that's ready to run a wide range of applications for multiple operating systems, but what if you seldom use one of the OSes and later want to get rid of it? System Commander 2000's BackStep Wizard can undo previous automatic and manual partitioning operations. I easily removed and then reinstalled TurboLinux. Win98, resident on the same computer, remained unaffected. There are a few situations that BackStep cannot handle, however, such as recovering a deleted partition that has been overwritten by a new partition. If you use both Windows and Linux extensively, you might want to standardize on a single office suite to save having to master two sets of applications. I found StarOffice 5.1's word processing and spreadsheet programs impressive, and it also had a Web browser, an e-mail program, a database manager and graphics programs. William M. Frazier, a PC hobbyist, is postmaster of Taholah, Wash.